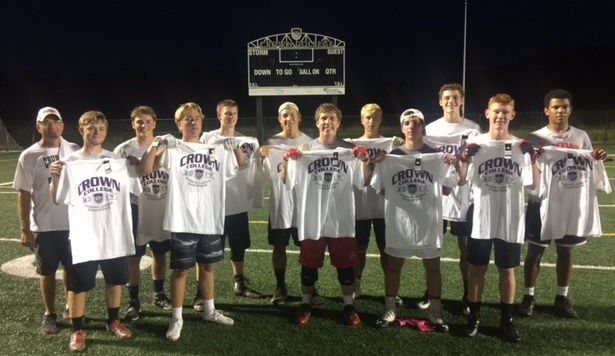 Congratulations to the Mayer Lutheran 7-on-7 Passing League football team, who went undefeated with a record of 9-0 to win the Silver Division at Crown College this summer. The team played six games on Tuesday evenings and earned the number one seed for the final tournament. The 7-on-7 Passing League includes two divisions split by size. The larger schools division includes schools such as Eden Prairie, Hutchinson, Orono, Glencoe, Rockford, Jordan, and Delano. The division in which MLHS competed included Howard Lake Waverly, NYA, Sibley East, Lester Prairie, and a few JV teams from some of the larger schools. The Crusader team played very physical defense and completed a high percentage of passes, earning points for 1st downs, touch downs and extra points. Baden Noennig had a very good summer as QB connecting numerous passes with an outstanding group of senior receivers, including Branden Carlson, Brock Hoese, Matt Menth, and Kenson Boelke.